Across the 10 fields at last weekend's Central Regional Showcase in Frisco, Texas, the colors and kits of Central Conference mainstays are plain to see. FC Dallas' distinctive hoops, the bright red of Chicago Fire, St. Louis Scott Gallagher's midnight blue and green. But some vibrant new splashes of color stand out across the pallet at the Toyota Soccer Center. The regal purple of Orlando City SC, the unmistakable yellow and green of the Tampa Bay United Rowdies, the bright blue and gold of Kendall SC. For the first time, Florida has come to play at the Central Regional Showcase- it's a coveted opportunity to carry their crests in the Lone Star State. 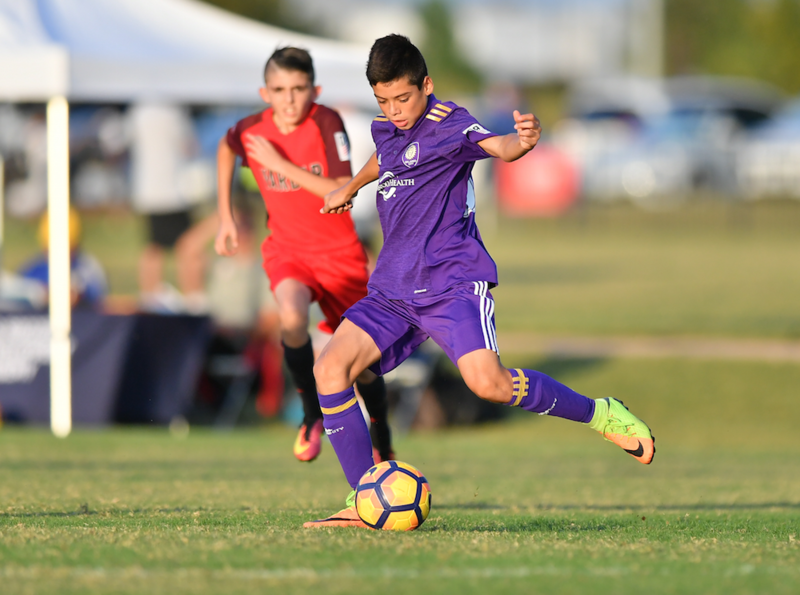 "We come to Texas as much as we can," said Craig Melton, Orlando City SC U-13 head coach. "It's really important to us… We love to play the Texas teams and we love to play all the other teams that meet us halfway." One of the Academy's central tenets is that clubs play more meaningful games. Week in and week out, teams face other top squads in their region, but at Showcases, the bar is raised with hand-picked match-ups from across the country. Technical Advisors and U.S. Soccer scouts watch games every week to evaluate clubs, players and the full gameday experience. These evaluations allow teams to be slotted in high-quality, meaningful match-ups at Showcase events. This year's new line-up of divisions and teams serve to provide even more competitive fixtures. For the ten Sunshine Division teams playing this weekend in Texas for the first time, the Showcase is an invaluable chance to challenge themselves against squads they don't see on any given Saturday. Academy Showcase events are built to allow the best teams nationwide to compete. Florida crossing into the Central Region puts that philosophy into practice. "For the Florida teams, it's great to compete against this region," said Marcelo Neveleff, Technical Advisor for Florida. "I saw Weston FC playing FC Dallas, I saw Orlando playing Columbus Crew. These guys never compete against each other until they're 15 or 16. It's great to see this so early and see where the Florida kids stand with the rest of the country." Playing Texas teams brings a little extra flavor for Melton, as squads like FC Dallas, Dallas Texans and Solar Soccer Club provide different styles and difficulties as opponents. He relishes the challenge they provide for Orlando. "Texas teams have all components of the game: technical, tactical, physical and mental," Melton said. "The kids from Texas can absolutely play with the ball at their feet, but they're gritty and can also play physical. They're mentally locked in, they have a culture. They just love the sport, it's ingrained in them." As a Technical Advisor, Neveleff is the direct link from U.S. Soccer to clubs in Florida, providing support in a number of areas. One facet of his job is to oversee the Sunshine State's talent identification network. The U-13 and U-14 Regional Showcase is the first event for these age groups, representing their levels' first major exposure to the U.S. Soccer talent identification network. This year's event in Frisco allows Neveleff to see how his state compares to the best of Mid-America. "It's important to vary the competition in a centralized environment," Neveleff said. "For talent identification, it's great because we are able to compare. We can see them competing. It's very exciting for the kids, knowing that they're going to be playing in front of scouts at the national level and the Youth National Team coaches." While the Showcase moves the U-13 and U-14 players through the early steps of the talent identification pipeline, the trip to Texas also contributes a progression in their player development pathway. A longer journey means that it's one of the first times that players are on the road without their parents, giving them a chance for team-building and a taste of growing to be a pro. "We fly them out here, we feed them, we take away all the cost. They're totally away and they get very entrenched in all the stuff that we do," Melton said. "It's really good for them to get away for the weekend and really concentrate on good nutrition, pre-game meals, pre-game talks, film study and evaluations. It's really good for them to take all that in."